Used in installations under concrete, asphalt, pavers or gravel roads. 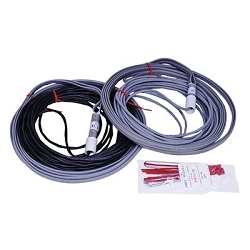 Wire is designed for direct burial application. Each burial loop comes with an installation kit including easy to follow instructions, cable ties, ground stakes, and stickers for easy identification. Offset the direct burial loop from the rebar pattern. Always run the lead-in through conduit and glue the joint with a proper PVC solvent cement. Run the lead-in in conduit underneath the rebar in a concrete pour. Remove any ground stakes before burying the loop in a gravel or dirt road. Residential applications recommend a 4 short leg of the loop. Commercial application recommend a 6 short leg of the loop.